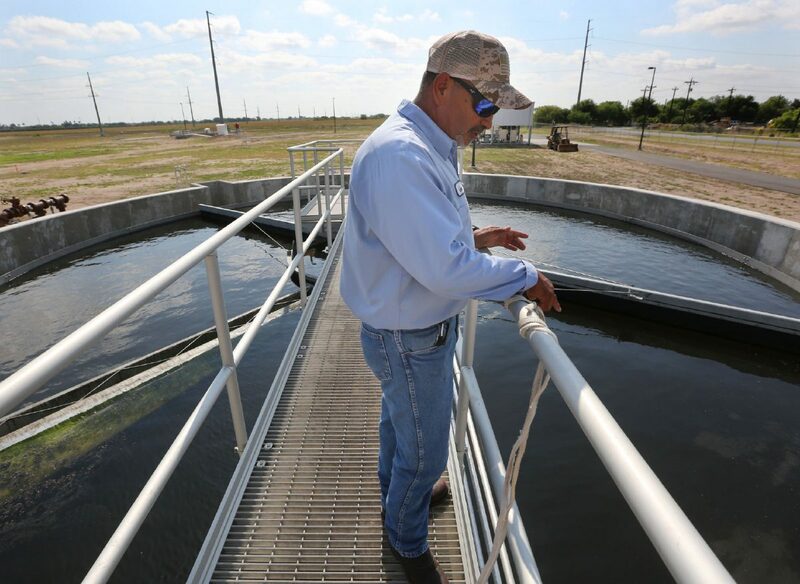 North Alamo Regional Wastewater Treatment Plant operator Gene Cantu looks over a clarifier Thursday, May 31, 2018, in Donna. NEAR DONNA — The North Alamo Water Supply Corp. on Thursday celebrated the construction of a new multi-million dollar wastewater treatment plant, which will supply sewage service to six underdeveloped colonia neighborhoods near Donna North High School. The new 500,000 gallon plant will provide sewage lines to about 317 homes in Alberta Acres, El Charro No. 2, Isaac’s Subdivision, L.J. No. 1, Muniz Subdivision and Tower Road Estates — six colonias located north of Donna. For years, residents of the six colonias used outhouses, cesspools and septic tanks to hold sewage waste. Many “were not in compliance with county or state regulations,” according to information provided by the corporation. The lack of sewage infrastructure in the colonias, located in a flood-prone area, resulted in raw sewage spewing into properties during torrential downpours, a health concern, according to corporation general manager Steven Sanchez. The new plant will be a fix to the gushing sewage problem. Old septic tanks will be removed, and through allocated funding, the corporation will fill the holes with gravel and soil. Along with proving sewage service to residents, the corporation will route sewage from Donna North High School to the new regional wastewater treatment plant located near the school. Through an interlocal agreement with the city of Donna, the school was sending sewage waste to the municipality temporarily. The plant will be running at full-capacity once in service, but the corporation owns 30 acres, allowing for the potential to expand it, Sanchez said. “North Alamo is being proactive and is taking first steps forward today to create a better future for the people living within the project areas and within our community,” said civil engineer Ivan Garcia with Rio Delta Engineering, the firm contracted to design and construct the plant. Garcia acknowledged the collaborative work by the local, county, federal and nonprofit entities for the success of the project. “I think the word regional really makes justice of what’s happened here,” he said. The sewage lines will be operational in about two weeks, when wastewater from the colonias’ homes will be sent to the facility for treatment before being released into the Laguna Madre, according to Sanchez. The corporation also plans to open a 700,000-gallon wastewater treatment plant north of Weslaco and seeks funding to construct the estimated $16 million facility to service the Sunrise Hill neighborhood, according to Sanchez. The new plant near Donna cost the corporation about $12 million to construct, most of which was paid through grants.